Richard “Ricky” Revesz seems determined to put the top talent at New York University School of Law on a career path to academia. Dean emeritus and Lawrence King Professor of Law, he has a simple strategy: Treat students as colleagues on published papers and research projects to give them confidence in what they can achieve. That’s what his adviser did for Revesz, a Princeton graduate, when he earned an M.S. in environmental engineering at the Massachusetts Institute of Technology. There was no such equal opportunity, he says, during his JD years at Yale Law. Revesz has gone far in redressing this weakness in the legal education culture. 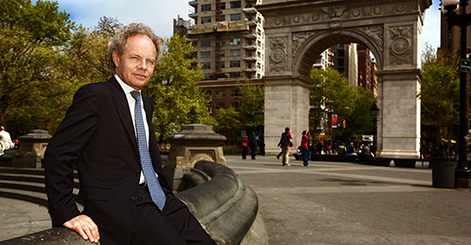 He co-authored seven papers with students in his 11-year stint as NYU Law dean that ended in May, hoping to lead faculty members (and, perhaps, academics at other law schools) to do the same. Opportunities to collaborate have been key to nurturing high-quality performance among his faculty, too, with Revesz building academic teams – a “critical mass of strong people” interacting with each other – whose combined talents have established NYU Law as a leader in many fields. Lawdragon: You took an unusual approach to faculty hiring. What was it, and why use it? Richard Revesz: Most law schools rely on the Noah’s Ark model for faculty hiring. You go after two people in each field and stop. I felt we’d improve the average quality of what we were doing by bringing in a critical mass of strong people so that we dominate a field. I’ve focused on some 12 fields in which I believe NYU Law is now the leader academically. And it’s not the students alone who benefit. Our faculty members have opportunities for powerful collaborations. Most people we wanted to recruit wanted to be the most prominent academic in their field. I don’t believe you can do that sitting in your study thinking deep thoughts and publishing periodically. You need to intersect with other smart, interesting people. Many academics from peer institutions saw that at NYU Law they could make these connections. Still, joining us wasn’t an easy or obvious choice for everyone. I told one prominent individual that if he wanted to continue creating on his own, he should stay where he was. If he wanted to be part of a vibrant community, he should move to us. He couldn’t decide which he preferred. It took him many months to figure it out. Now, we didn’t always win the ones who were initially undecided. But frankly, I wanted only people who would be committed, contributing members of our broader community. LD: Collaboration seems to be a core value for you. Why? RR: I was treated as an equal by my adviser at MIT, where I studied engineering. It’s something I really came to value, since it gave me so much confidence as a grad student to be considered a colleague. I can’t describe the sense of loss when that disappeared in law school. You find faculty-student collaborations all the time in graduate schools, particularly among science faculty. It turns out that they are very unusual in law schools. I wanted to change that – and not only because I feel that law students should experience the same sense of worth and accomplishment that I did. Collaborating with faculty is also a way to encourage talented law students to enter academia. Nick Bagley, for example, was one of my students and we ended up collaborating on a piece about administrative law that was named best in the field in 2006 by the American Bar Association’s Section on Administrative Law and Regulatory Practice. He was by about 15 years the youngest person to win that award. He’s now a professor at the University of Michigan, which hired Nick without him really being on the market. My point is that we have terrifically talented students capable of becoming anything they please in the law. Making them co-authors, giving them responsibility, treating them like colleagues, I believe, helps steer them into academia. I have others in the pipeline. Admittedly, I didn’t start doing a lot of this until I was a dean. But in my almost 11 years as dean I collaborated almost every year with students. I hope that by modeling this behavior I’ve been encouraging others to do the same. I also say, only half jokingly, that collaborating with students was an efficient way for me to stay active and publishing. With all that I had to do as dean, finding uninterrupted hours to work on a paper or book was difficult. I could more easily find 45 minutes at various times in a week to talk through ideas, edit segments, write a draft or otherwise work with a colleague. And I wasn’t staring at a blank screen by myself – so it was much less daunting psychologically. LD: What are your other core values? RR: Mentoring – not just to help students get jobs, although mentors play a critical role in helping students get jobs that are distinctive, that are personally fulfilling and particularly hard to get. But getting back to the larger concept of mentoring, I’m a huge believer in education as a creator of human capital. That’s why we increased opportunities at NYU Law for students who are the first in their families to go to graduate or professional school, for students from socio-economically disadvantaged backgrounds. And I don’t mean that we simply hand over scholarship money, although that’s obviously important. We’ve added enrichment programs so these students are exposed to people and ideas that they probably would not have encountered at home. My wife, Professor Vicki Been, and I would host small dinners, for example, where they have informal conversations with leaders from business, government, law. Yes, there is some networking going on. More important, by hearing how these individuals got started, their successes and setbacks, where they came from and what they achieved, our students see what they themselves can aspire to, what they are capable of. LD: What law school graduates can achieve in terms of careers these days seems tempered by a changing job market. How is NYU Law responding? RR: We’ve long been a leader in legal education, and we are continuing in that role with a series of curricular changes approved in 2012-13. The initiatives draw on recommendations by a special committee of the board and are aimed at ensuring that our graduates are optimally prepared for the evolving needs of today’s legal marketplace. To prepare students for increasingly globalized law practice, for example, we’re expanding our already robust international offerings to include new study abroad programs in Buenos Aires, Paris and Shanghai. In Washington, D.C., a new semester-long clinic for third-years offers intensive study and practical training in the role of government, combining four days a week of work in a federal office with a weekly seminar. At all levels of the JD program, the law school will increase training in leadership and financial and business literacy. Finally, to help students prepare for practice in a particular area of law, we are introducing a Professional Pathways scheme that provides advice on a sequenced course of instruction, as well as career guidance from faculty members, career counselors and alumni. LD: For all the benefits of these changes, what about the costs? RR: The cost of law school is unquestionably high, but I’m convinced that attending a top law school is still a very sound economic decision. Here’s why, speaking of NYU Law in particular: Well over half of our graduates take jobs with major law firms, where compensation is sufficiently high to enable them to shoulder even substantial loan payments. For the high percentage of our graduates who pursue careers in public service — at public interest law organizations or in government, for example — we have one of the most generous loan repayment assistance programs (LRAP) of any law school. JD graduates earning up to $80,000 can have all eligible law school loans forgiven, and even those earning more than $80,000 may be eligible for LRAP benefits. LD: How has the more challenging job market influenced admissions? RR: Applications to NYU Law have declined over the last few years, though not nearly as steeply as they have for law schools overall. It’s a trend that we’re watching, but even with a drop in applicants, we’ve been able to admit classes with outstanding credentials – virtually the same average GPAs and LSAT scores as when applications were much higher. The job market is more challenging now than before the economic crisis, but we’re meeting those challenges head on with changes to our curriculum, stepped up efforts by our outstanding career services office and other initiatives. Also, I’m happy to say that, at least at NYU, we’ve seen an improvement in the job market over the last couple of years. LD: A member of the search committee that appointed you said no one considered fund raising your strength. Yet you raised $50 million in each of your 11 years as dean. What happened? RR: They were right not to think it was my strength. I had never done it. Then I got started and I recognized why I was succeeding. As I told the search committee members looking for my replacement, they need to like spending time with a candidate. If they don’t donors won’t. They’ll turn down the meeting. Also figure out if the candidate is organized. As dean you have a million problems every moment; you need to block out time for donors months in advance and plan your visits well. You have to be really organized. LD: That was one lesson you learned as dean. What were the other lessons? RR: It’s enormously exciting running an institution, as against your own small area of work. I learned that I like that. I learned a lot about the power of leverage, especially about leveraging pools of talent – the talent of faculty members, the talent of students. I learned how to be a better delegator, which in turn taught me about the difficulties of delegating and about understanding and accepting your limits. LD: What is it like transitioning back to being full-time faculty? RR: I enjoy having more sustained time to work on academic projects, including a book on the failures of U.S. environmental policy. I do sometimes feel that I’m accomplishing less, since as dean I had scores of people doing something as a result of what I decided. But you know, I have a wonderful family and am enormously fortunate that my wife and children were so understanding of the pressures I faced as dean. I’ll have more time with them now. I love to travel with my wife, who is on the NYU Law faculty and the Director of the Furman Center on Real Estate and Urban Policy, and with my two children, Joshua, who graduated from Yale, and Sarah, a freshman at Swarthmore. My wife, daughter and I garden, bike and play tennis together. My son and I spend time discussing politics and playing chess. And all of us play complicated board games together. By the way, I love New York and enjoy the quest for the perfect foods including burgers, french fries, sushi, etc. Here is one of my finds: http://blogs.law.nyu.edu/foodcourt/2013/01/got-a-beef-with-the-dean-i-did/ . Other recommendations are always welcomed.